Well, we're moving. And one thing I'll have in the new place (hey, you get what you want when you design it yourself) is a network drop in the pantry. So it finally made sense to buy one. 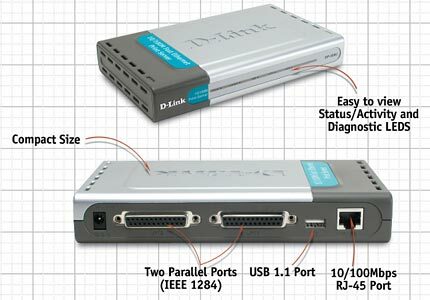 The D-Link DP-300U to be exact. I ordered it on Sunday for a song and it was here on Tuesday. Aside from having to change the default IP address (careful, there's no hard-reset button, so make a mistake and you've got a paper weight!) it "Just Worked." I could cry. My HP LaserJet 1100 has never been happier and I'm clicking print and picking up the jobs on the same floor. The same floor! Imagine. "You just proved bench advertising works!"